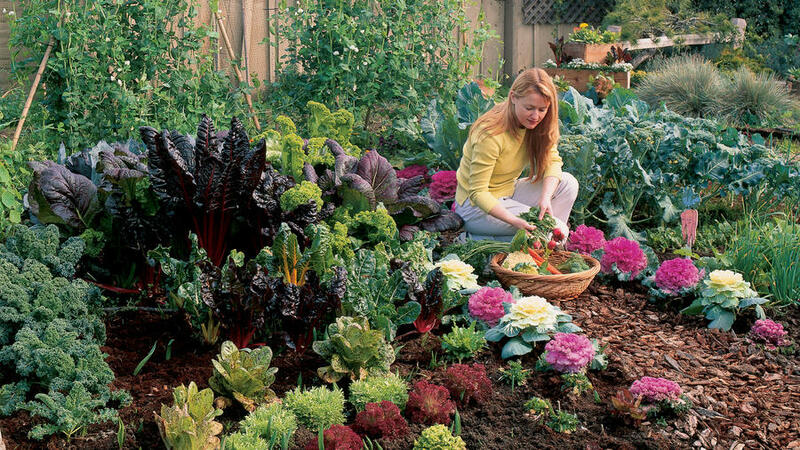 One of the blessings of gardening in mild-winter areas is the opportunity to grow many vegetables during the fall and winter months. It’s no wonder gardeners are fond of the cool season: Insects are fewer, rainfall is more abundant, and weeds aren’t much of a problem. What’s more, the list of crops you can grow during the cool months is surprisingly long if you live west of the Cascades or Sierra Nevada or at lower elevations in the Southwest. To demonstrate what you can grow, we planted two vegetable plots in Sunset‘s test garden in Menlo Park, California. One of Sunset‘s editors once observed: “Starting a garden is like catching a train. If you’re late, you miss it.” Our chart shows when to plant so you’ll be on track for fall and winter harvest. You can start cool-season vegetables from seeds if you sow early enough, or set out transplants later in the season. The advantage of seeds is their low cost and great diversity. You can order from a seed supplier by computer, fax, or phone and obtain almost any variety of vegetable you want within a few days. Nurseries carry seedlings of many winter vegetables, but their selections may be limited. Dig plenty of compost into your garden soil before planting. Loose, light well-amended soil is easier for roots to penetrate, retains nutrients better, and drains well after winter rains. Since you’re starting tender seedlings during the heat of summer, you’ll need to shade them with floating row covers after planting. The row covers not only shield the young plants from the scorching sun but also help keep insects at bay and provide frost protection during the cold months. Fertilize at planting time, then once every two months. You can use any complete fertilizer, but in our test garden, we used fish emulsion exclusively. By far the fastest and most effective way to start a vegetable garden ― especially if you have poor soil ― is to use raised beds. Filled with light commercial topsoil, raised beds afford excellent drainage and warm up quickly in mild, sunny weather. The loose soil is easily penetrated by roots, making it possible for carrots and radishes to develop perfectly. You can frame raised beds with lumber or form unframed beds like ours by shaping soil into level, flat-sided mounds about 8 inches high. If there’s room in your garden, try succession planting. Consider the salad crops you use up fastest ― lettuce and radishes, for example ― then plant a dozen seeds of each every two weeks until frost. That way you’ll be sure to have enough plants at all stages of maturity to ensure against any losses caused by unseasonable heat or early frost. Leaf crops give you a bigger, longer yield per plant if you harvest a few outer leaves at a time instead of removing the whole plant. However, if you see flower buds start to emerge from any leafy vegetable except Swiss chard, harvest the whole plant right away; the flowering process (called bolting) makes leaves bitter on everything except chard. Among the root crops, beets and carrots can stay in the ground until you’re ready to use them. Radishes should be harvested as soon as they’re big enough for salads. If you’re growing onions for the green tops, pull them as soon as they’re ready; if you’re growing onions for bulbs, leave them in the ground until next summer. You can buy seedlings of many winter vegetables at nurseries and garden centers. But for the widest selection, check out nursery seed racks or order from seed companies. Some good companies include (207/437-4301), (541/928-9280), (888/880-7228), (541/942-9547), and (604/482-8800).